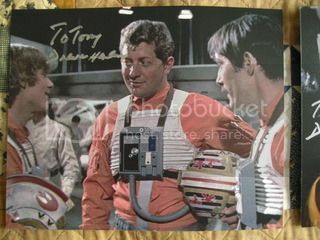 Discussion in 'Autograph Collecting' started by Vader Nation, Mar 19, 2009. Mr. Henley has appeared in numerous supporting roles in 1960's British films and television. He has also appeared on stage in both London and on Broadway. He is currently retired from film acting. What a great success, Mr Henley signed all 4 that I sent him. Very happy, thank you!! Congrats on the great successes! Which address did you use? Received a success this week! 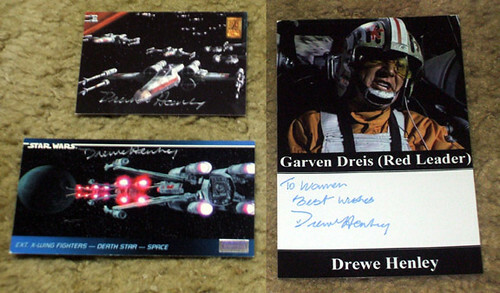 Drewe Henley, aka Garven Dreis (Red Leader), sign both of my trading cards and inscribed my photo. Interesting. All four of mine look the same, so I wonder who signed them? Your photos have all been signed by Mr. Henley himself (judging from a distance - but they look real). The expert, who told Bounty CK that Mr Henley only signed the CCG was correct. All other cards he got back have been signed by Lyn Henley. Very nice and fast success from Mr. Henley today. He signed all 3 CCGs I sent to him. Took less than a week (inside europe)! Can anyone shed any light on this for me? Do these look like his writing or his wife's? I don't have any way of telling. Judging purely by Bounty CK's pics, if his CCG card is authentic and the others are not....the biggest difference I see is that the CCG signature has a very pointy "D" in Drewe. The rest, although made with sharpie, are more rounded. My signatures are all rounded. Your signatures, are pointy-ish...considering they are signed with sharpie. Really hard to say. You may notice that the vertical line in the D's is very inconsistent in all the sigs we have on this page. Some have the line attached to the top of the D, the bottom of the D, or free floating in between the curve of the D.
Some of this may be the result of different pen types (thick sharpie, thin, blue pen, etc). Also may be a result of writing surface. 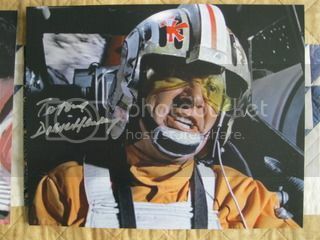 The ESB Widevision cards are extremely glossy and hard to sign with some pens.